Healthy,well balanced and filling meal..
That is such a colourful, delicious buddha bowl. Really interesting! Just one bowl and so many components ! Wow ! I like such foods and planning to make a variety of these since long . Awesome bowl which is making me hungry ! Do we need anything else to finish a meal happily, just a fabulous bowl with interesting ingredients in it. Loving it. Who wouldn't love a meal like that! Especially when now the onus is on having meals with all food categories in it, this bowl ticks all the right boxes... that peanut butter sauce is making me weak! Wow, such a healthy bowl it is. Peanut sauce and roasted peanut definitely give the nice flavor and crunchiness to this dish . Excellent share!!! These rice bowls have become quite a craze these days and I LOVE them too. There are no rules to making them and they are great to use up last bits of ingredients. Your peanut sauce recipe with tamarind date chutney sounds yumm!! Pinned!! Seriously that is one healthy and filling bowl of deliciousness! 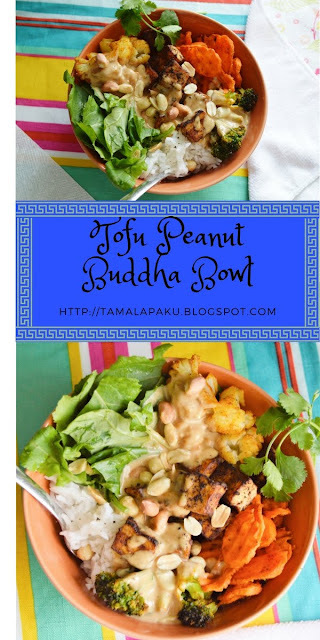 HAve plans to make a budha bowl but looks like I am never getting around to make it! !